INDIANAPOLIS (AP) Riding a five-game win streak and facing the team with the NBA’s best record, the Indiana Pacers had a chance to make a statement. The Boston Celtics had other ideas. Kyrie Irving scored 25 points and Al Horford added 21 to lead the Celtics to a 108-98 victory Saturday night. In a span of 10 minutes, Boston went from trailing 56-47 to leading 82-70. The Celtics outscored Indiana 37-16 in the third quarter and outrebounded the Pacers 11-3. Boston made nearly every facet of the game difficult for Indiana in the third quarter. And with Indiana center Myles Turner on the bench for much of the period in foul trouble, the Celtics exploited Indiana’s defense both inside and out. After taking a 54-45 lead into the half, Indiana looked to be in position to push its win streak to six. Lance Stephenson, starting in place of leading scorer Victor Oladipo (bruised right knee), had 12 points in the first quarter to get Indiana off to a solid start. Domantas Sabonis, getting extra playing time with Turner in foul trouble, had seven points in the second along with Thaddeus Young. Each time the Celtics made a run, the Pacers had an answer. But after the break, the Pacers went cold, and Boston took advantage. Horford had 12 points in the third, when the Pacers had a pair of three-minute scoring droughts. Terry Rozier had eight points off the bench en route to a 17-point night. Stephenson had 16 points and eight rebounds, and Sabonis had 17 points and eight boards. Oladipo did not play for the first time this season. He sat with a bruised right knee sustained in Friday’s 107-104 win over Toronto and is day-to-day. Celtics: F Jaylen Brown missed the game after remaining in the Atlanta area after attending the funeral of a friend. 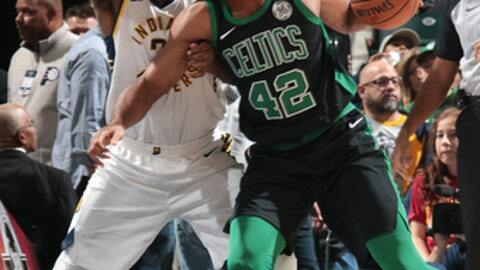 … F Marcus Morris also sat out to rest his left knee. . After sweeping Indiana last season, Boston ran its win streak over the Pacers to four games with Saturday’s win. . Boston begins a five-game homestand Monday. Pacers: Six players finished in double figures for the second straight night. … Indiana had 20 turnovers. . After missing seven of Indiana’s first eight games while in the NBA’s concussion protocol, Turner has scored in double figures in eight of his 12 appearances. Saturday’s game was the Celtics’ fifth game eight nights. Celtics: Host Detroit on Monday. Pacers: Host Orlando on Monday.